I'm overwhelmed. And I'm not even talking about Christmas shopping lists or the box in the backseat full of research papers I must grade and soon. Over the last month, I have been bombarded by book titles. Honestly, sometimes I wish my favorite writers would take off some time--only those who could afford to do so, of course--and let me catch up. I know, though, that catching up is a total impossibility. Between the Southern Festival of Books in Nashville in October and the NCTE conference, with sessions and exhibitors taunting me, I know I can never make even the slightest dent in the list of books I want to read. If I never left the house and had nothing to do but read, I'd never catch up. Not only am I facing all the brand new titles, but I'm admitting to the classics I have yet to read. Right now, I'm listening to Nick Hornby's Juliet, Naked and reading Abraham Verghese's novel Cutting for Stones. Meanwhile, I'm intrigued by the title The Boy Who Couldn't Sleep and Never Had To by D C Pierson, and I have Eat, Pray, Love and Wally Lamb's last big novel on audio in my back seat. I also want to read the young adult book Countdown by Deborah Wiles before giving it away to a younger reader friend who covets it. Just arranging and rearranging my bookshelves is a constant reminder of the futility of my task. To make matters worse, I have other interests--so many other interests, a family I love and a job to which I go happily five days a week. When's a girl to read? As I've reported before, one of my favorite conference sessions every year is called "Readers Ourselves." Facilitated by the same four people every year, the session invites participants to sit in a circle and talk about what we've been reading lately. There are a few loose rules: write down the titles you mention (and authors if you know them); talk about books you are reading, not the books you are teaching; focus on adult reading; try not to monopolize the discussion. This is the special session at NCTE each year that focuses on what was as adults are reading. We don’t care what your students or children are reading…there are hundreds of such sessions. This session is for big people and their books. These are the books NCTEers are reading to inform their personal lives. * Let the Great World Spin – Colum McCann – Multiple narrative center around Philippe Petit 1974 tightrope walk between the twin towers. * Island Beneath the Sea – Isabelle Allende – Follows the lives of the Blacks and plantation owners before and after the slave revolt in Haiti. * Cutting for Stone – Abraham Verghese – A great story with cultural and family conflict. Makes one question homeland and family and what we leave behind when we mature. The book follows twin brothers who become doctors. * Was God on Vacation – Jack van der Geest – WWII - 16-year-old young boy when Hitler invades Netherlands. Became a member of the Dutch Underground, becomes a political prisoner, escapes from Birenwald concentration camp, becomes a member of the French Underground, becomes a member of the 101 Airborne Division, etc. 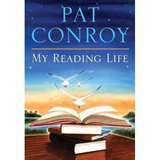 * My Reading Life – Pat Conroy – True story – at our institution we have a freshman seminar all freshmen take. We also have all freshman buy the same book and we have a campus wide discussion. We’ve done Race Matters, Band of Brothers. One year we picked The Lords of Discipline. Conroy, who was close by in Beaufort, SC, was invited to come to a freshman convocation (academic get-up, a whole campus event). Length of talk – twenty minutes. Remember about 2500 kids bought this book. We offered a $2000 honorarium and expenses. Pat said, sure he’d do it for fifteen grand. I will never read another word this shakedown artist writes. Sorry…when you do the list, you can write your editorials too. . . . . because I realize how many books I've read this past year have been nonfiction. This latest, The Immortal Life of Henrietta Lacks by Rebecca Skloot, is a fascinating blend of science and biography of an African-American woman whose contribution to the world of science and medicine--although without her knowledge--has worldwide impact. While she was being treating for cervical cancer in 1951, doctors harvested some of her cells and discovered that they continued to grow prolifically. Since then, they've been sent into space and have been used in studies not only related to cancer but polio and HIV. While the cells have been sold commercially to labs throughout the world, Lacks' own family didn't even know about the cells for many years, although they were living in poverty with numerous health problems. 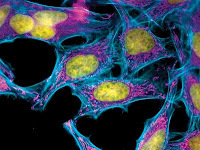 Skloots first heard about Henrietta's cells (identified as HeLa cells) while in school and began a quest of many years to tell the story, breaking down barriers of resistance in Henrietta's family, to learn about the real woman. Skloots' style, blending science and narrative, created a fascinating story with the pace of a novel. I was as fascinated to see the picture of Henrietta's cells (above) as her grown children were. As a side note, I was glad to see the book made the short list of titles on Carol Jago's"Intrepid Reader" at NCTE this weekend. I will be telling you about the book-related sessions, conversations, and exhibits in my next few posts--as soon as I get home and unpack my book of notes. Since the outgoing NCTE president Carol Jago is one of the most voracious, passionate readers I know, one thread that ran through this conference was the value of literature to our lives. At these kinds of sessions, one is likely to hear talk of pedagogy, assessment, empowerment--all the education jargon--and I won't downplay the importance of good sound teaching practice. But when people were talking about about reading, they came alive. Suffice it to say that my shoulders are aching now from carrying bags loaded with my last-minute book acquisitions from my last loop through the exhibit hall. I have others in a box en route to my house and others in the back seat of my friend and fellow-conference-goer Jane's car (assurance that we have to meet somewhere between my house and Durham soon for the hand off.) One of the most fun parts of the conference each year is the exhibit hall, where most of the major publishers show. Sure, there are lots of textbook publishers and other educational companies there, but lots of the books are the ones we want to read for our own pleasure. I leave the conference each year not only with a renewed sense of purpose but with a reading list that could easily carry me through to next November. The first email I received this morning came from my daughter in Nashville, announcing that Davis-Kidd, my favorite bookstore there (one of my favorite bookstores anywhere) is closing as a part of the Joseph-Beth Chapter 11 proceedings. These announcements are becoming more and more frequent, in part because of the decline in reading, in part because of all the online shopping avenues, and in part because of electronic books. Surely I'm not one of a meager few who enjoy the experience of shopping in bookstores. I like the displays, the sales tables, the infused scent of coffee and pastries. I like to strike up conversations with strangers as we peruse the shelves. I tend to monopolize the time and attention of the employees the way I once took over the elementary librarian as my personal assistant. I think of students who sign up for online classes only to find they miss the actual physical presence in the classroom. I consider all the disappointing online and catalog purchases--clothes I should have tried on before buying. Can you imagine in later years waxing eloquent about a well-loved website? Maybe bookstore rescue parallels the old starfish story: I can't save them all, but maybe I can make a difference to one! Since I read Prince of Tides many years ago, I have made a point to read all of Pat Conroy's books--the novels and the memoirs. As a teacher, I loved The Water Is Wide," but I found Lords of Discipline and The Great Santini just as powerful and, at times, shocking. I have noticed that ever Conroy novel has one good sports chapter, the story of a big game that can stand alone as a short story. Conroy has just released a new memoir that's right up my alley, which he called My Reading Life. His chapter topics range from his mother's early influence to that of Gene Norris, his beloved English teacher, as well as a mean librarian, an independent bookstore owner in Atlanta, and a number of his favorite books and authors--Margaret Mitchell's Gone with the Wind, Tolstoy's War and Peace, James Dickey, and Thomas Wolfe. The book is evidence of Conroy's self-awareness. He not only knows his influences but recognizes the marks they leave on him. His revelation of his own reading habits are infectious. He decided at sixteen to read at least two hundred pages a day, working his way through the list of great literature, sometimes more than once, and discovering new writers along the way. He had a lot to say about poetry and poets as his muses. He also pays tribute to one of the strongest human urges, naming "Tell me a story" as "the most powerful words in the English language"(303). I heard him speak at a local college a few years ago, and afterwards I ran into a friend who asked, "Do you really think all those stories he tells are true?" I had to remind myself that she was not Southern. Of course they're true. Down here we all have similar stories of our own. One particular line in the book struck a chord: "Few things linger longer or become more indwelling than that feeling of both completion and emptiness when a great book ends" (311). Exactly. 2. Sometimes I read a book from the library and then feel I have to own it anyway. 3. I feel guilty borrowing books I know I probably won’t read. 4. My fourth grade teacher read the entire Little House series to us. 5. I love to read aloud. 6. If I don’t have an audiobook for the car, I get twitchy. 7. When I was back in school, I would find an author I loved and to read all of his or her books, working my way through the library shelves. 8. I have a hard time getting rid of books. 9. When I donate books to the library’s book sale, I too often end up going myself and buying more than I gave away. 10. I’ve read lots of books late, late at night—even on vacation—sitting in the bathroom so I wouldn’t wake the family. 11. I like to have books signed by authors. 12. I actually read my signed first editions. 13. I am an author groupie. 14. Few things make me happier than for someone I like or love to read a book I’ve read so we can talk about it. 15. Sometimes I judge a book by its cover. 16. I never read the last page ahead of time. 17. I always rush to get to the end of a book then feel sad when it’s over. 18. Lots of times, after I finish a book, I immediately re-read the first chapter—or the last chapter. 19. I don’t feel bad about loving a book someone else hated. 21. If I really love a book I’m reading, I call my dad (or someone else who’d like a particular passage) and read. 22. I read with a book mark on which I write notes about passages I like--or words I want to define. 23. I write in my paperback books with a very sharp pencil and very straight lines. 24. I don’t find the eBook experience at all inferior to traditional books, but I wish I could write on them and share them. 25. If you borrow one of my books and don’t give it back. I remember. I may not accuse you of stealing, but I remember. 26. I read Little Women and The Wizard of Oz for the first time in the first or second grade. 27. I can read in the car without getting carsick. 28. I have read while driving. Not proud of it, but I did it. 29. Local bookstores make me happy in the same way art museums do. 30. My elementary school librarian influenced me as much as any teacher I ever had. 31. I have many friendships based almost completely on our mutual love of books. 32. I married a man who loves good books. I can't image living with a nonreader. I'd love to see your lists too. 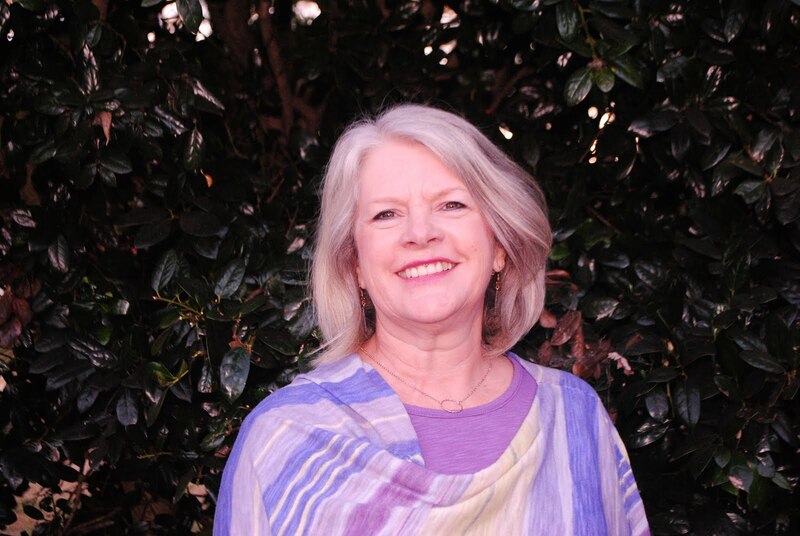 At the recent Southern Festival of Books, I had a chance to hear from several authors to whom I've been introduced through the Lemuria First Editions Club. I joined several years ago, and each month, almost like magic, a new signed first edition shows up on my doorstep. At the festival, I heard from Sonny Brewer, Rick Bragg, Lee Smith, and Brad Watson. At two different sessions, I heard from Tom Franklin, a name I recognized, having read Hell at the Breech, a story of murder and attempts at justice in 1898 Alabama. I also realized his novel Smonk still sits in my "to read" stack. Franklin's latest novel Crooked Letter Crooked Letter (a reference, as any young spelling student knows, to the mnemonic device for spelling Mississippi) has been getting lots of attention since its release. It was among a short list of suggestions of fall reading on the Today show last week, in fact. With all the books discussed at the festival, this was one of the novels I bought, only to find another signed copy--from Lemuria--at my door when I returned home. A sign? Perhaps. This time Franklin sets his novel in the last twentieth century and present day. He follows two protagonists, Scary Larry, accused of murder as a teenager and suspected again, and Silas, the town's one policeman, a black man, who at one time had lived with his mother in a cabin on Larry's family's property and had for a short time befriended Larry. Silas, normally relegated to directing traffic when the plant shift changes, begins to follow hunches and finds victims of murder or attempted murder--real police work. When Larry is found near death and bleeding from what many believe is a self-inflicted gunshot, Silas reenters his life. Franklin shared a person incident from his teenager years that inspired a critical incident in Larry's life during a breakfast session in which he and three other writers discussed, among other things, how they handle elements of their stories drawn from people they know, people who might recognize themselves. His sharp wit and sense of humor--and my earlier enjoyment of his previous novel--led me to the book table as soon as the session ended. Now that I've read one copy and shared the other, I'm ready to add Crooked Letter Crooked Letter to my list for those who ask for reading suggestions. Note of trivia: On this season's ticket for the Alabama-Mississippi state game, the printers omitted one of the humpbacks.